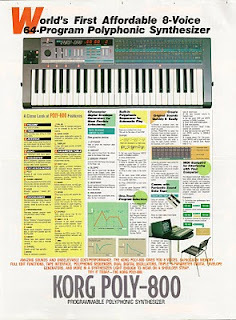 Korg Poly-800 eight page fold-out poster/brochure from 1984. "Or send $3.00 (check or money order) to Unicord, 89 Frost St., Westbury, New York 11590 for a Poly 800 demo record, color brochure and poster." Could this be that color brochure and poster? Both in one printed piece? It would make sense. Now I just had to find a way to scan it. Its real size is a rather large 16 x 21.5 inches. Too big for my home scanner and the local UPS store scanner/printer. So, I actually scanned it in four chucks to a side, and, unlike most of my scans, combined the pieces together in Photoshop. Gah! Once created, I uploaded through Blogger, but because they were over 1600x1600 pixels, Picasa shrunk 'em down. Boo. So, in the end I uploaded them to Live.com. You have to do an extra click to view the larger version, but its worth it. :D I also dumped both of the hi-res images into a PDF. What an awesome piece this brochure/poster is. So much reference information, all clearly laid out with some great design. So detailed are the step-by-step instructions, that in many cases, the text in this poster replaces the need for a manual. And where readers don't find step-by-step instructions, Korg provides other detailed information about the keyboard. For example, just look at the info under the "6 Parameter Digital Envelope Generators" section. 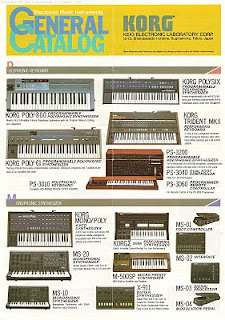 Korg provides lots of info for their "Newly Developed ADBSSR System". Nice! Another example - the big photo of the Poly-800 with the alpha-numeric references that lead readers to more detailed info below. Excellent. The front of the poster/brochure is just as cool. The front image of the Poly-800 in space reminds me of the classic "cat on a synth in space" Web page (there might be pop-ups on that Web page - click at your own risk). 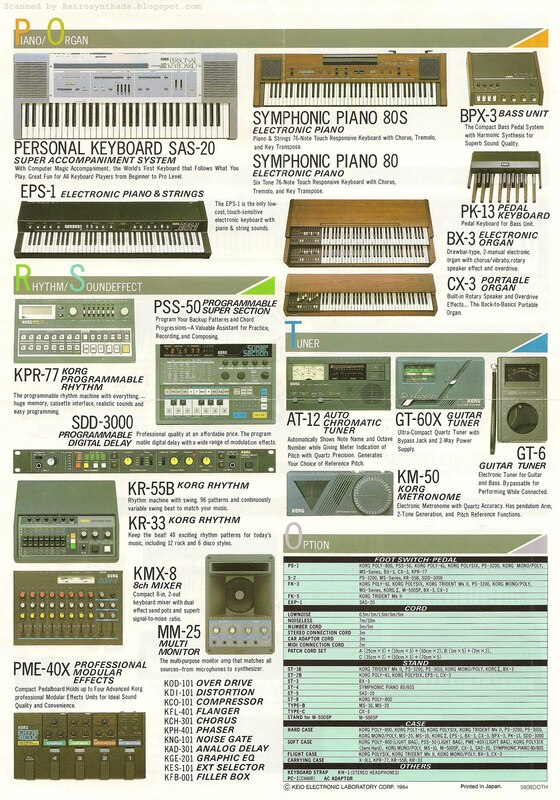 And the other side of that section contains all the reference specs for the keyboard, as well as a great list of all the accessories that were available from Korg in 1984. AND another photo of the back of the synth. Flip that side of the poster upside down and you get some more great photos of Chuck Leavell and the Poly 800 in a few not-as-awkward-as-the-ad photos. But for me, one of the most interesting features of the poster is the photo of the reverse keyboard displayed next to the computer. 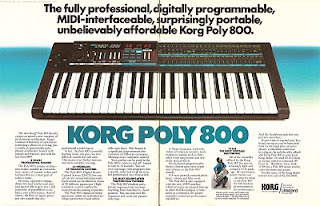 I find this particularly fascinating because if this poster/brochure was actually the one promoted in the introductory Poly-800 ad, then that means that the reverse keyboard version was actually available early on, or even at the same time as the launch of the original version. Or at least a prototype was. Which means Korg had the forethought to produce a cool alternative version right from the start. Anyways, I love Korg. Seriously. 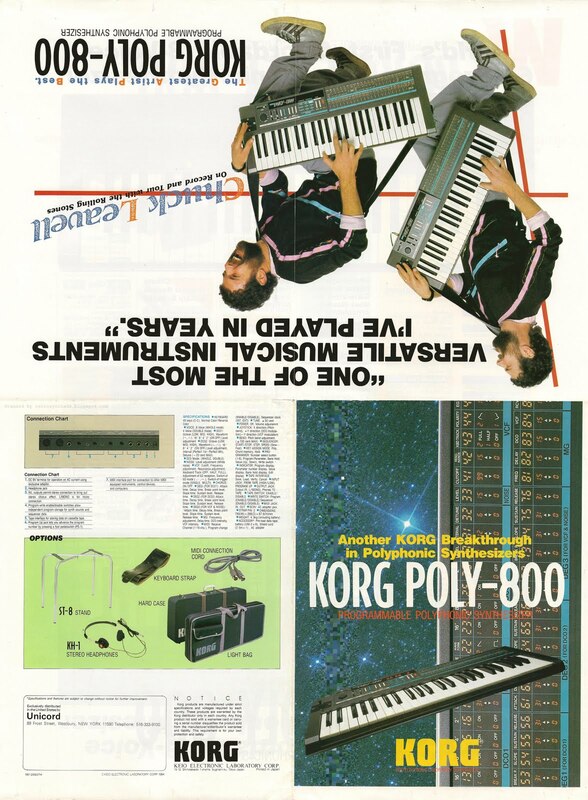 Korg Poly-800 synthesizer two-page and one-page advertisements from the inside front cover (and/or page three) in Keyboard Magazine starting in February 1984. 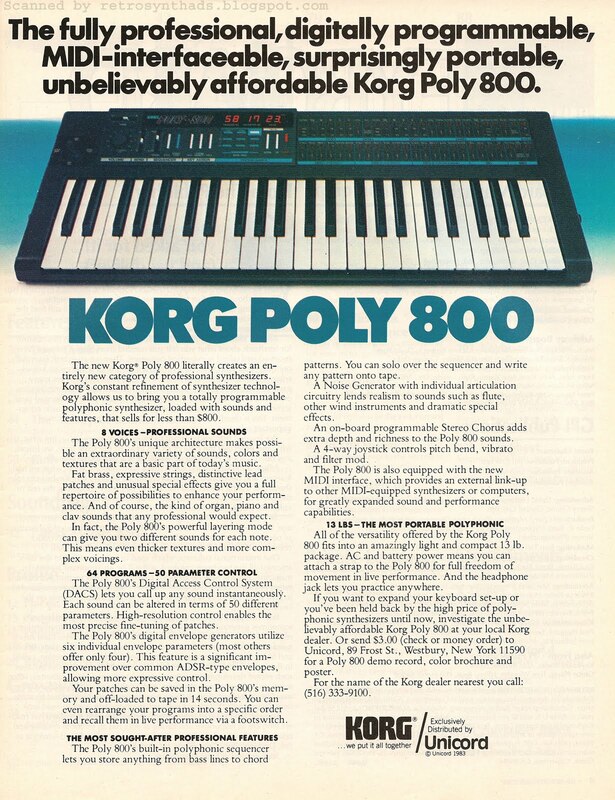 This was the first Korg ad to feature the Poly 800 - and Korg obviously wanted to hit the press with a loud synthesized bang. And as far as I'm concerned, they *almost* did everything right. First, they kept the marketing campaign running for an extended period of time. The two-page version of the ad ran in that costly front-of-mag advertising space for a full six months - from February to July '84. 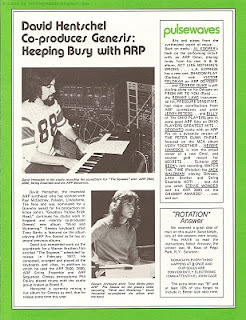 Then, they switched it up with a one-page version of the ad for the August and September '84 issues of Keyboard for a total ad run of eight months. 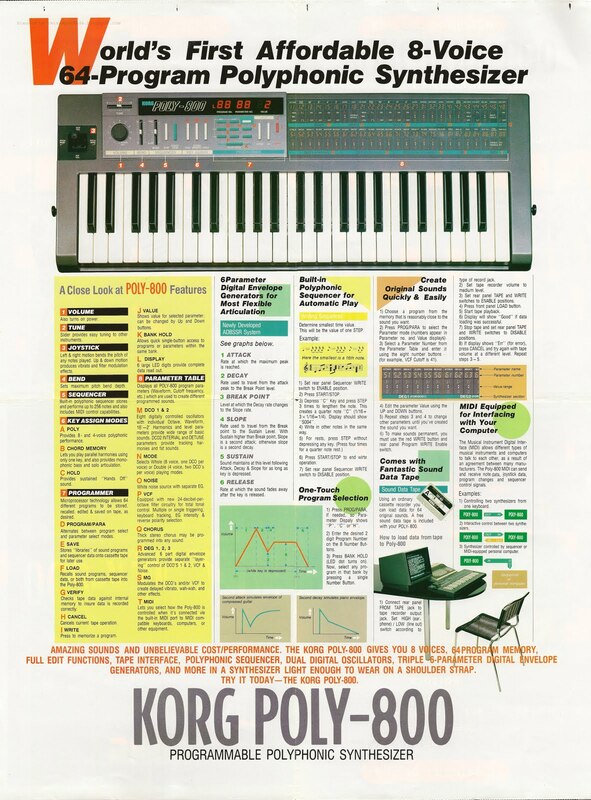 Then, after a bit of a break, Korg brought back the one-page version of the ad to page three of Keyboard from July to November '85. Next, the layout it top-notch - well balanced, bright, with adequate white space. 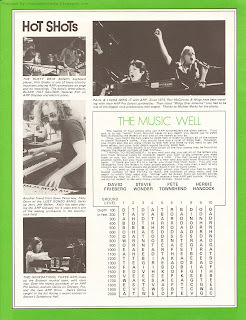 The ad contains a nice centre-fold photo of the instrument with the name of the instrument in big fat letters. Even the rather long winded tag-line is well placed and comes with a dash or wordplay. 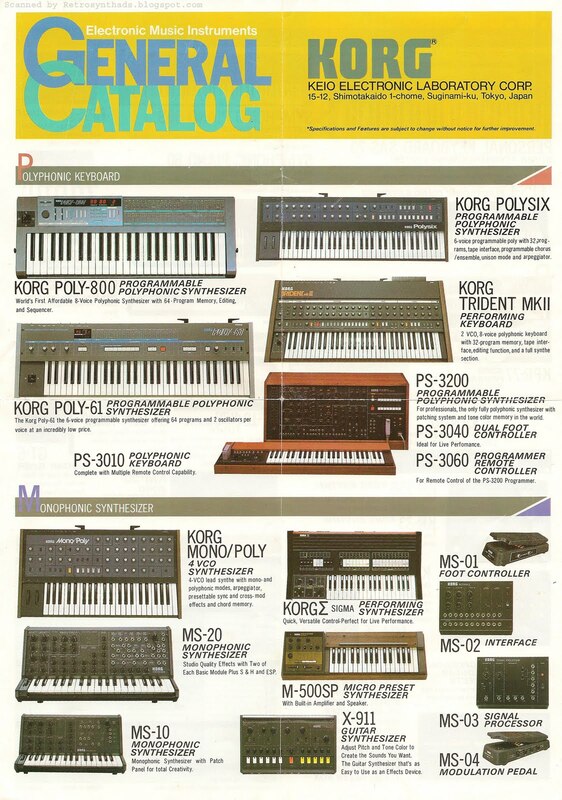 Also, unlike a lot of introductory synthesizer ads that feature a HUGE photo and little or no ad-copy, Korg made sure to use those two pages of space to get a fair bit of synth info about the Poly 800 out to the masses. They give details on the eight voices, 64 programs, 50 parameters of control, the polyphonic sequencer, noise generator, on-board chorus, 4-way joystick (awesome! ), MIDI and even the headphone jack. If that isn't already enough of a feature buffet, Korg also let readers know that the keyboard also doubles as a 13-pound keytar! 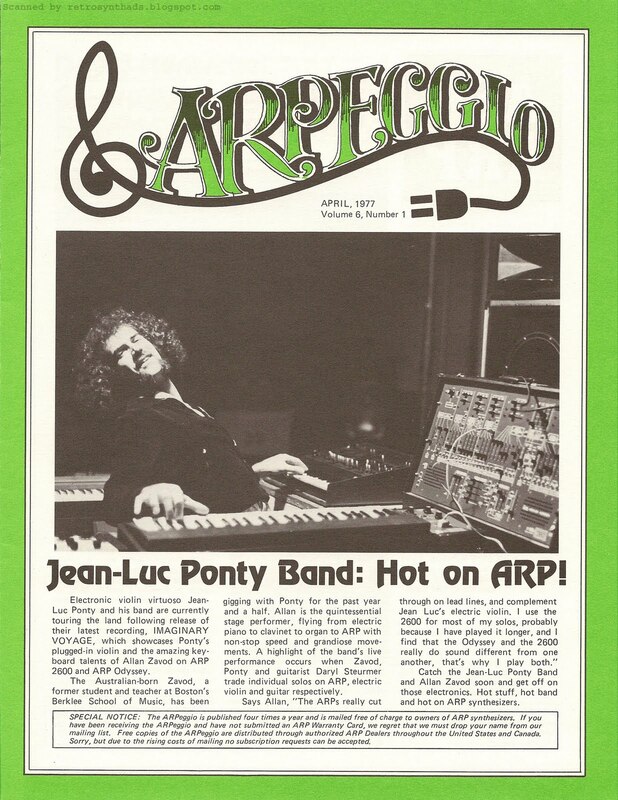 Although, I do think they could have used a better photo of Chuck Leavell rockin' out on his Poly 800. Not only does the one hand position look a little uncomfortable, but Chuck himself looks like he is having an awful hard time trying to lift that thirteen-pounder. Don't get me wrong, I respect his musicianship, but I think Korg was smart to not try and cram that photo into the one-page version of the ad. Just sayin'. And finally, to put the icing on the cake, Korg even advertises a price. All this for "less than $800". Normally, I would have suggested going with the ol' psychological $799 price tag, but providing a number that lines up the price of the instrument with it's name is another small win for Korg. The only thing Korg seemed to have missed out on with this product launch was the lack of any promotion in the Spec Sheet section of Keyboard. If there was one, I never came across it. But that's small potatoes with this smooth launch. 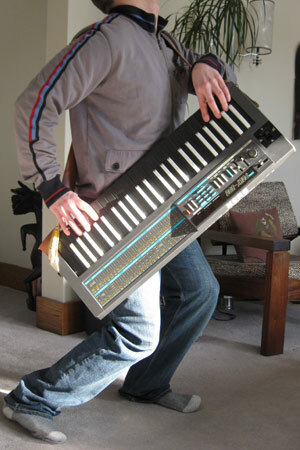 "Korg Synthesizer Keyboard. A limited edition of the Korg Poly 800 with a reverse color keyboard is now available. 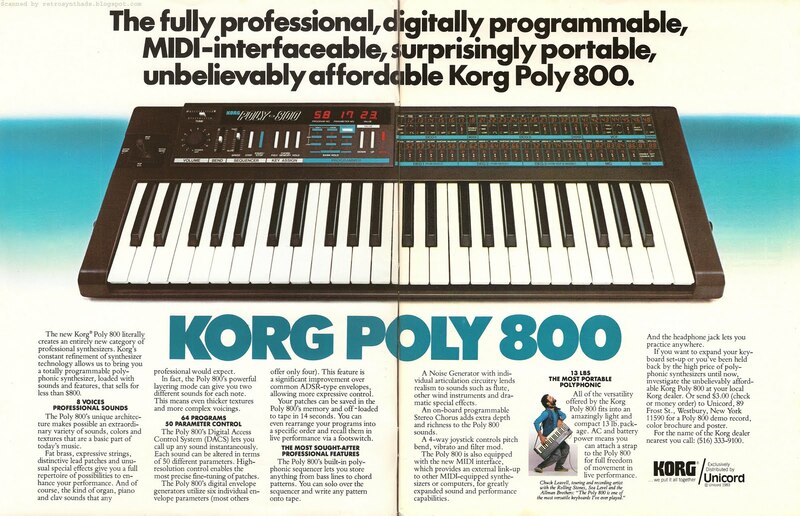 All other features of the Poly 800 remain unchanged: 64 memory positions, 256-note sequencer, MIDI, and six-segment envelopes are standard. Price is $849.00. Korg, 89 Frost St., Westbury, NYT 11590." Korg even had the balls to charge an extra 50 bucks for the privilege of sporting those reverse keys around your shoulders! Worth every penny. I happened to come across a reverse key version of the Poly 800 a long while back at my local music store. It was just sitting there all lonely. So, ten minutes and $99 later, it was at home, strapped around my shoulders, and plugged in. Quite honestly though, back then, it just didn't do it for me at first. I thought there were just too many limitations. 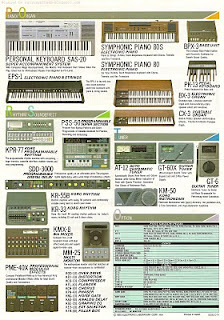 I was a bit of a synth-snob back then. But over time, the more I played with it, the more fun it became. The chorus adds good movement to bass sounds without being too noisy. And combine that the noise generator together with the organ-like DCOs (each with its own extended envelope!) and you can start coming up with some great sounds. I use it a lot as a sample source for my chiptunes. It can almost sound Nintendo-ish sounding. My GF came over and saw it on the floor as I was trying to take a picture for this blog post, so I just had to try it on for her. The next thing you know, we were trying to emulate Chuck's pose from the ad. The results....? About as uncomfortable as getting an open-mouth kiss from your drunk aunt during a family reunion. End note: And yes, that is a Green Lantern pillow on the chair behind me. It rawks almost as much as my reverse colour keyboard Poly 800. 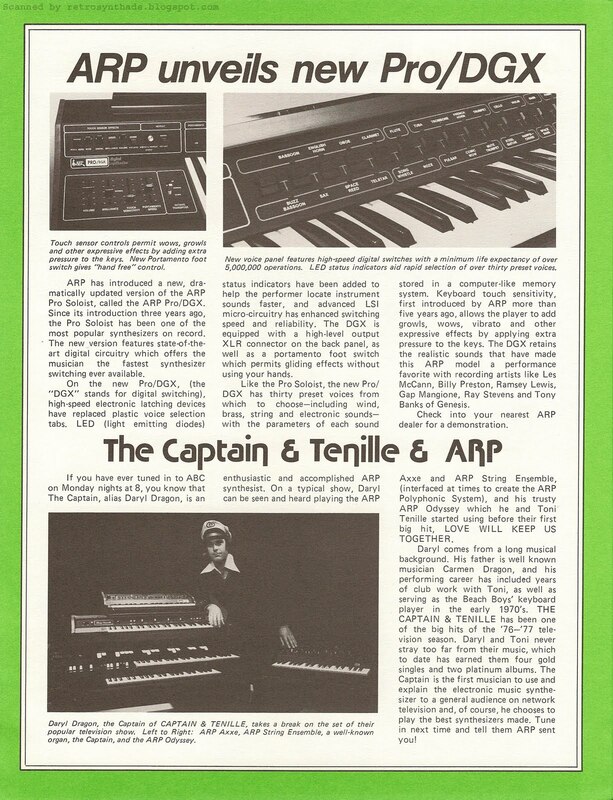 Korg KPR-77 Programmable Rhythmer advertisement from page 9 in Keyboard Magazine January 1983. When I first started getting interested in analog gear, I totally ignored this thing. I seriously never noticed it. Maybe it was always there, listed beside the 606 whenever the topic turned to small drum machines on Analogue Heaven or on Web site forums, but for some reason or another it was always in my blind spot. And when I did start to take notice of it, I found that it was often referred to as the KPR-77 Rhythmer. And I couldn't figure out where the "Rhythmer" part came from. So, when I finally saw this ad, everything started to make sense. I originally thought the word "Rhythmer" was strictly some kind of Korg term because I usually saw it associated with the KPR-77, but every now and then I saw it pop up on other gear, like the Farfisa Melodic Rhythmer. 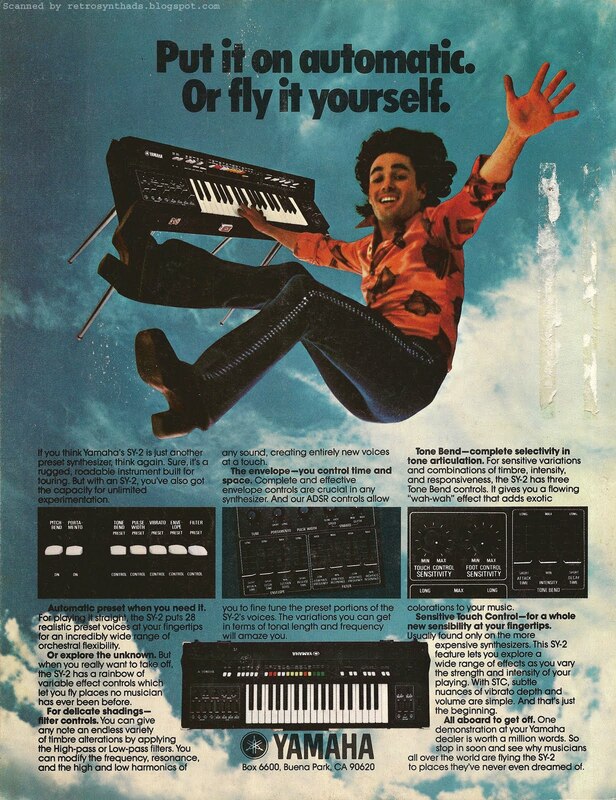 And even though Korg calls it a "rhythmer" in the title of this ad, it's not called a rhythmer on the actual unit. So, maybe it's just another generic term to describe rhythm units in other parts of the world? Anyways, I guess the point is that I think "Rhythmer" is one weird looking word. Make a good band name. Or at least an album title. I do like this advertisement from a design point of view. It's nicely balanced, with "KPR-77" in big, bold, bright letters against a dark background. And the font the title is sporting is simply spectacular. It's one of those retro-fonts that has a modern feel to it. In fact, the ad as a whole is fairly modern looking. The photo of the KPR-77 is nice and large too. I'm not sure I like the fact that there is a solid white line running vertically right through it. It doesn't really get in the way of any detail in the photo, but whoever the designer was had some big balls to get away with it. 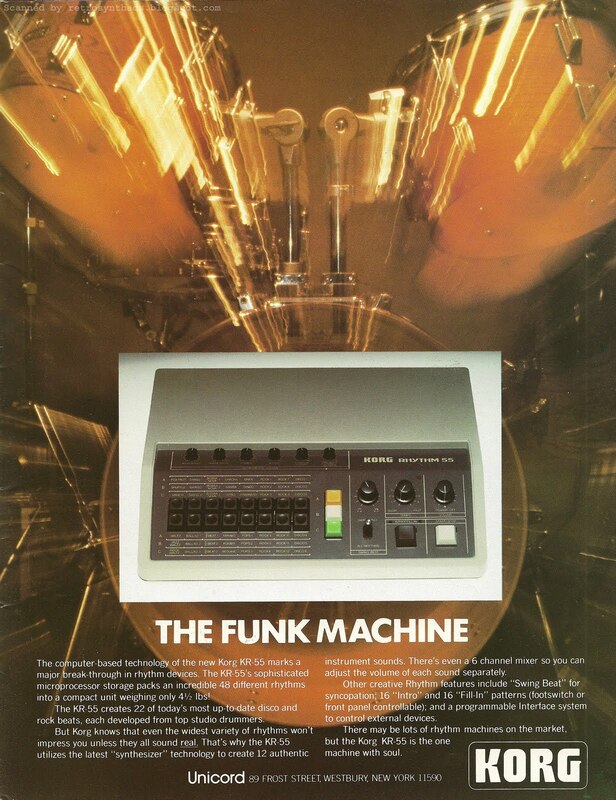 Interestingly, Korg took the design style from this ad and used it for their SDD-3000 Programmable Digital Delay - font, glowing piece of gear, lots of ad-copy. 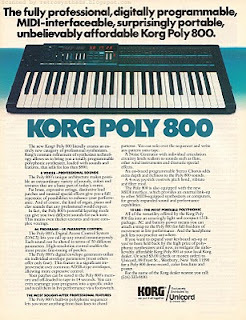 But another big piece of Korg gear that appeared in 1983 - the Poly61 - didn't use this design at all. 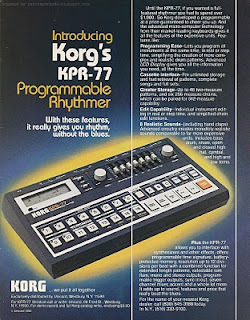 "Korg programmable Rhythm Unit. The KPR-77 Programmable Rhythmer stores up to 48 2-measure patterns, and six 256-measure chains tha can be combined to produce three 512-measure chains. Other features include the ability to program all instruments simultaneously in real time, a cassette interface for external storage of patterns, analog-sound generating circuitry, and AC or battery operation. Sounds include bass drum, snare, open and closed hi-hats, cymbal, high tom-tom, low tom-tom and hand claps. A 7-channel mixer is built-in, the clock can be interfaced to external synthesizers, sequencers, and other drum machines, and there is a stereo headphone out-put. Unicord, 89 Frost St., Westbury, NY 11590." 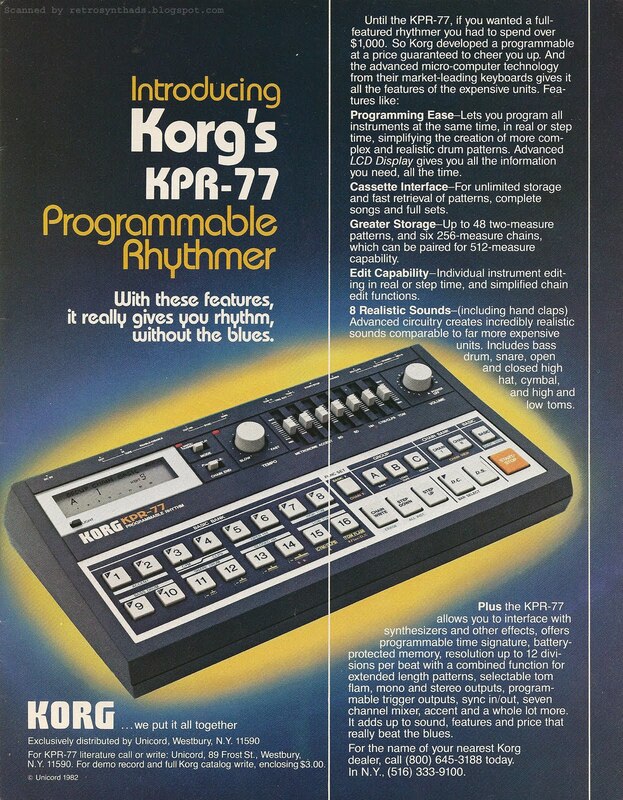 Most forum comments and sites such as Vintage Synth Explorer suggest that the KPR-77 was Korg's answer to Roland's TR-606. But, lucky for Korg, Roland's well-known TB-303/TR-606 ad had stopped running regularly in keyboard six months previously. 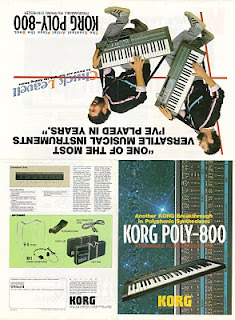 But because Korg's ad only ran twice in early 1983, I don't think Korg really took advantage of this golden opportunity. And Roland did bring that 303/606 ad back for a one-month run for the holiday season in December 1983 - probably taking some holiday money away from Korg. One of the coolest links I found online while researching this thing was a custom mod done on a KPR-77 at circuitbenders.co.uk. It included a face lift as seen in the first photo on the page as well as tons of functionality. Scroll down to the bottom of the page to hear some fantastic samples. "Unless you want to pay an outrageously obscene amount of money there is absolutely no way that we're doing this again! 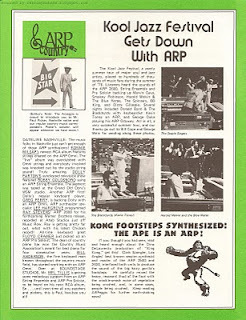 This was one of those occasions where an initial 'good idea' slowly snowballs into an avalanche of nervous breakdown inducing tweaking ;-)"
ARP Arpeggio newsletter from April 1977, Volume 6, #1. I love these newsletters. I've scanned two others (you can view the Arpeggio Newsletter label to bring them all up on the screen), and although this newsletter doesn't contain as many pages as the last one, there is still so much historical information in it that it makes me want to puke (in a good way). Eight pages of juicy synth goodness. Hmmm - now that I look at it, I wonder if maybe I'm missing a few pages since there doesn't seem to be a bulk postage/mail section where an address can go. But, then again, it would have been on the last page, which due to the folding process, is printed next to the first page. Which I do have. Also, the "Special Notice" at the bottom of page one may indicate that they changed their mailing practices as well. 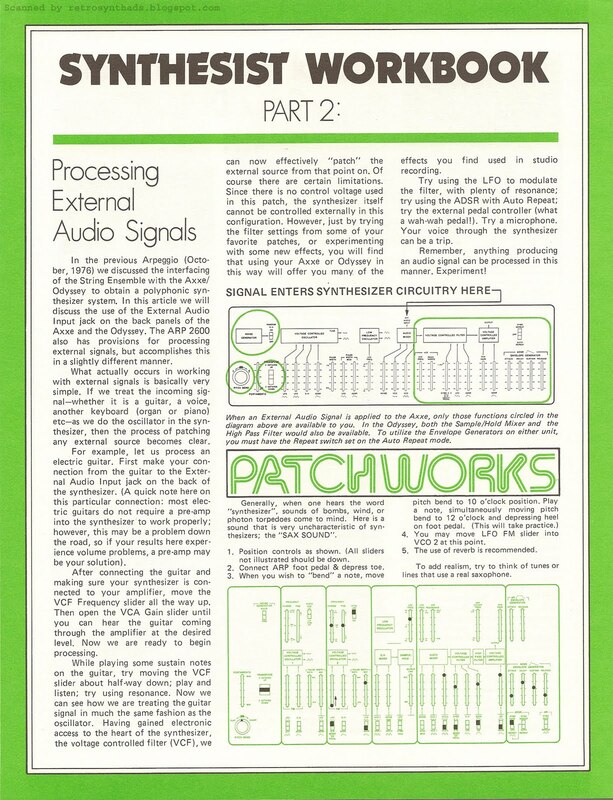 This newsletter may have been one of the free copies "distributed through authorized ARP Dealers throughout the United States and Canada". Anyways, I've scanned the eight pages as images as well as packaged them up in a handy-dandy PDF. "ARP recently supplied a complete ARP 2500 system and a skilled operator to appear in the upcoming Columbia Pictures film, "Close Encounters of the Third Kind." 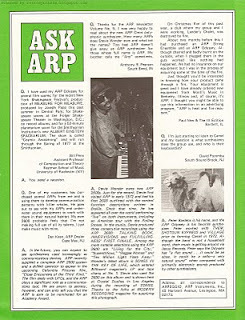 The film deals with UFOs, and the ARP plays a significant role as a communications tool." 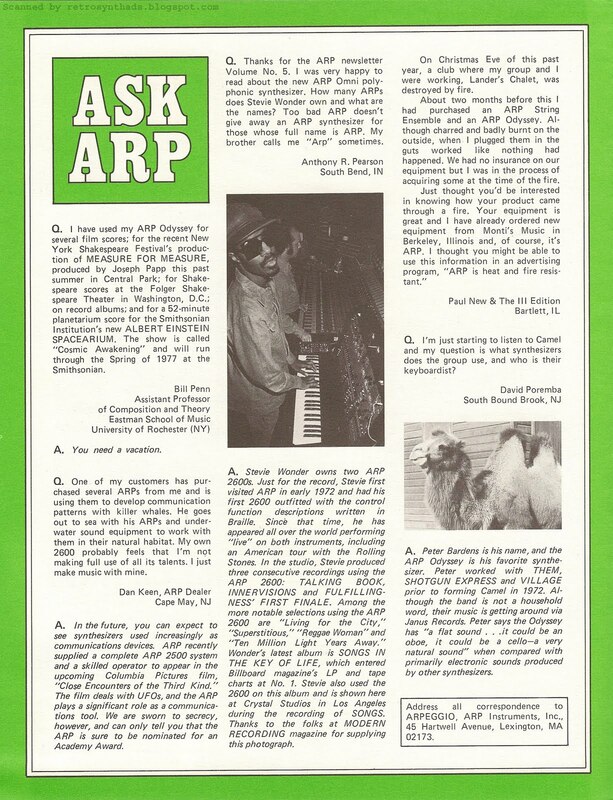 "Stevie first visited ARP in early 1972 and had his first 2600 outfitted with the control function descriptions written in braille. " 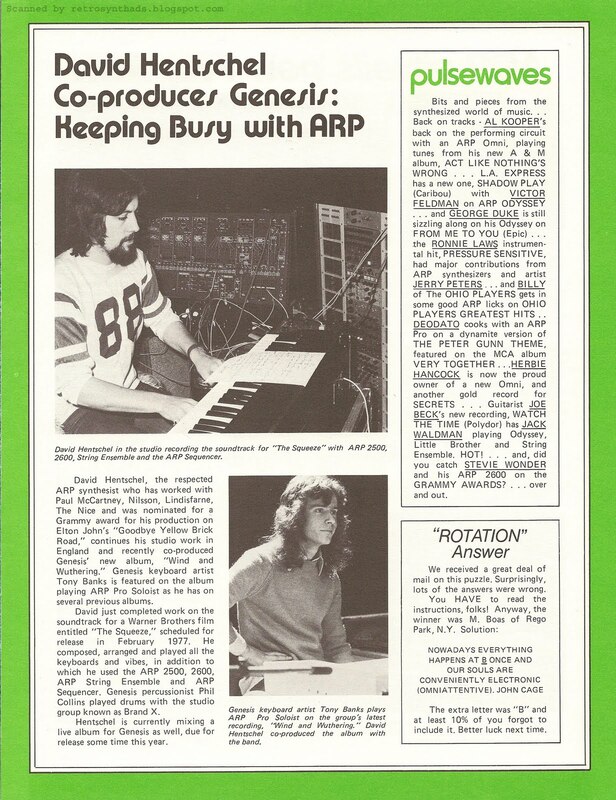 Flip to page four and we get a eyeful of their new PRO/DGX synth, along with a big helping of good ol' ARP name dropping at the end. 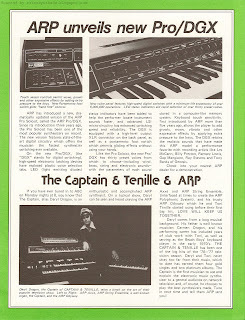 And underneath that, an article called "The Captain & Tenille & ARP", with a photo of the Captain posing with his mostly-ARP gear. Did he really wear a captain's hat? Seriously? Seems a little too... I dunno... something or other. "Clark Spangler, Los Angeles' best known session synthesist and master of the ARP 2500 and 2600, interfaced both units to produce the sound of the big hairy gorilla's footsteps. He carefully mixed the heavy, resonant thud of the foot with the crackle-smash noise of vegetation being crushed, and, in some cases, people being crushed." 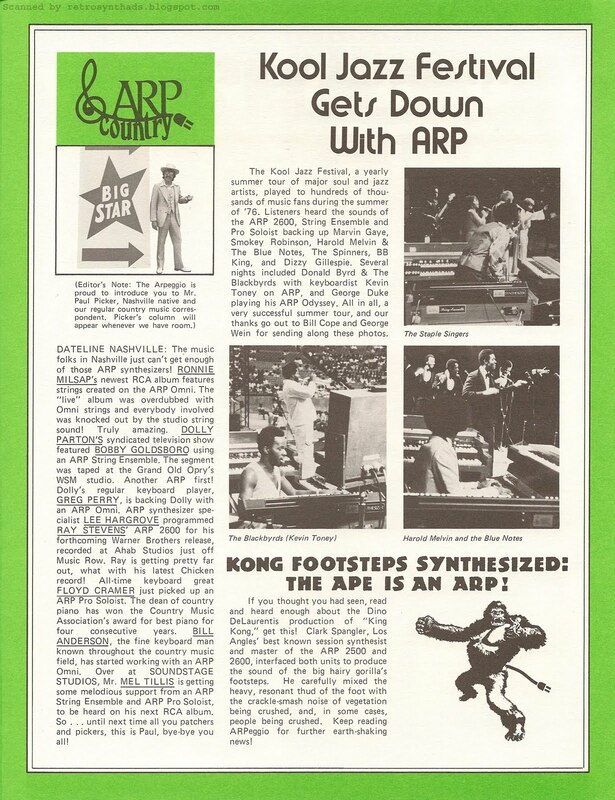 I think that ARP plug coming out of the back of the image of King Kong is supposed to be a tail. But, um... gorillas don't have long tails, do they? Looks a little creepy. 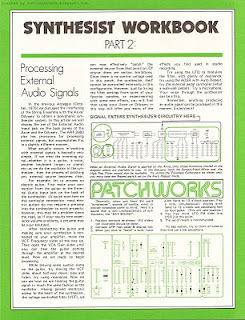 Page six has a great article on external audio processing, as well as one of my favorites - Patchworks! I dig that outline of a synth panel. Yum. But for me, the most exciting bit of info in this newsletter is on page seven in the reader contest section called "The Music Well". The prize is a free ARP belt buckle! I posted a few photos of my brass ARP belt buckle just a few weeks ago. It has a date of 1977 stamped onto the back - the same year as this newsletter - so I'm betting the contest prize has to be the same model. 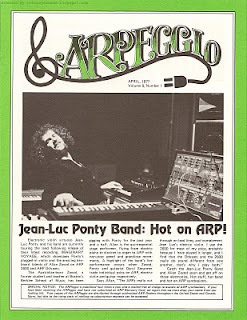 And this is the first time I've seen a reference to the ARP belt buckle in print. 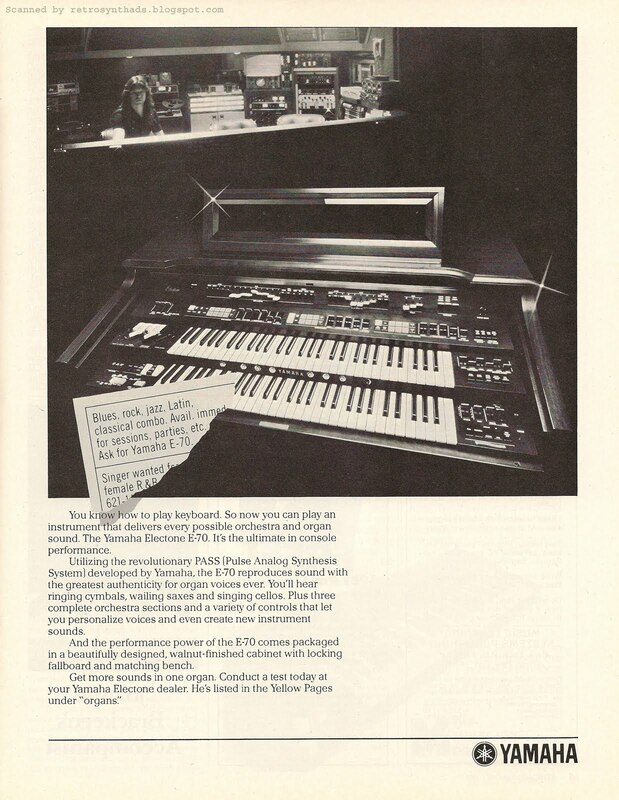 Yamaha E-70 organ ad #2 from page 15 in Contemporary Keyboard Magazine March 1981. This ad confuses me. And creeps me out a little. Okay- it creeps me out a lot. And not just because the dude looks like a project manager that I work with. Luckily, like most of the E-series ads, this creepy one only ran a couple of times in the front half of 1981. Looking through past Yamaha ads, they've always kind of hinted at a sense of humor, but it has always been really understated. A cute little catch phrase or tag line here and there, like this one about organs that do everything with music except dance. Queue the small chuckle. But in my mind, the first two things that pop into my head when someone mentions "Yamaha", is "quality" and "sound". To me, that was, and still is, their brand. Yamaha will always be all about the serious musician in my mind. With this in mind, I decided to see if I could find anything out about Yamaha's brand. The idea being that if Yamaha has been doing a good job of branding all these years, my "feelings" about Yamaha should come close to what they say their brand is. "The three tuning forks of the Yamaha logo mark represent the cooperative relationship that links the three pillars of our business -- technology, production, and sales. They also evoke the robust vitality that has forged our reputation for sound and music the world over, a territory signified by the enclosing circle. The mark also symbolizes the three essential musical elements: melody, harmony, and rhythm." Well, that's eerily similar. Good job, Yamaha! So, then, what the heck is going on with this ad? "You owe it to yourself..."
"Every sound is produced with the greatest authenticity...."
So then my mind needed to try and connect that weird photo back to the serious ad-copy, so I looked back at the photo and my eye was immediately drawn directly to that facial expression on the guy - which quite frankly borders on maniacal. Then my eye started looking at the surrounding scenery in the photo. The wall paper. Curtains. Fake plant. Picture of fruit. Lamp. Not to mention the totally fake tree outside the window. All crammed into such a small space making this image look totally absurd on more than a few levels. Again - is it looking a little weird, or is this just me?!?!? I showed it to someone else to see if I just wasn't "getting it". Luckily for me, that person agreed. In fact, the whole photo is so surreal that she said she "was expecting Chick Corea to peak through the window". She also said the guy in the photo's wife "was probably waiting for him to die so she can turn it back into a sewing room". Bazinga! So - was the ad trying to be humorous? Or serious? Three years earlier, CK had done a survey and found that the average age of it's readers was just over 25 years. They were also predominantly male. 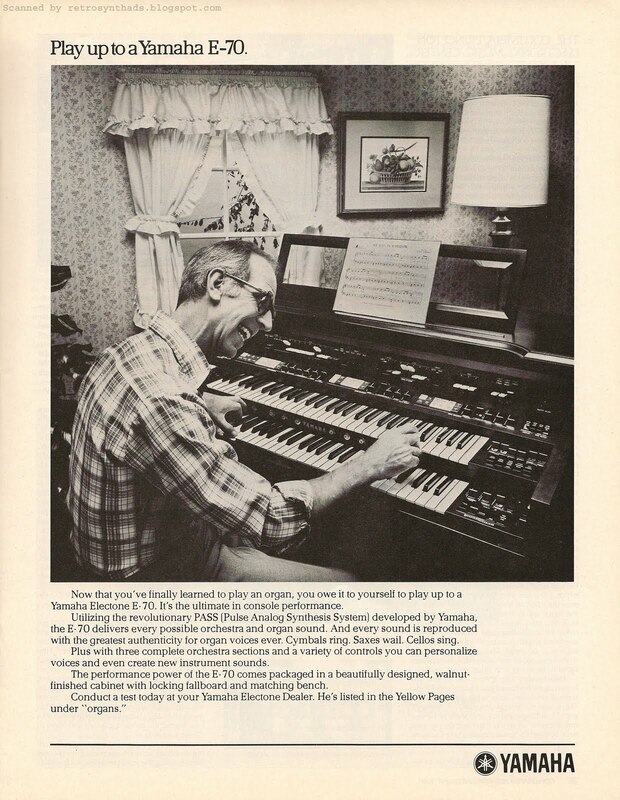 So, if you believe that Yamaha was trying to be totally humorous in the ad photo by showing an old guy rockin' out on an organ in his living room (and right now I'm leaning towards this point of view), then the ad may have "clicked" with this younger audience. Laughing at the older generation of organ players, etc... But, the serious ad-copy would not have reinforced the imagery, and in my mind, the ad may have failed in its purpose. On the other hand, in the off-chance you think the photo wasn't supposed to be totally funny, then it also fails. Because I'm pretty sure no 25 year old wants to be this old guy playing an E-70. Or even better, "the kids" would probably want to be like a famous musician... Avid E-70 user FlameTopFred tells me that Pete Townshend had both an E-70 and CS-80, and used an E-70 on Eminence Front and a few other Who songs. He directed me to a Web page on thewho.net for more reference info (do a search for e70). 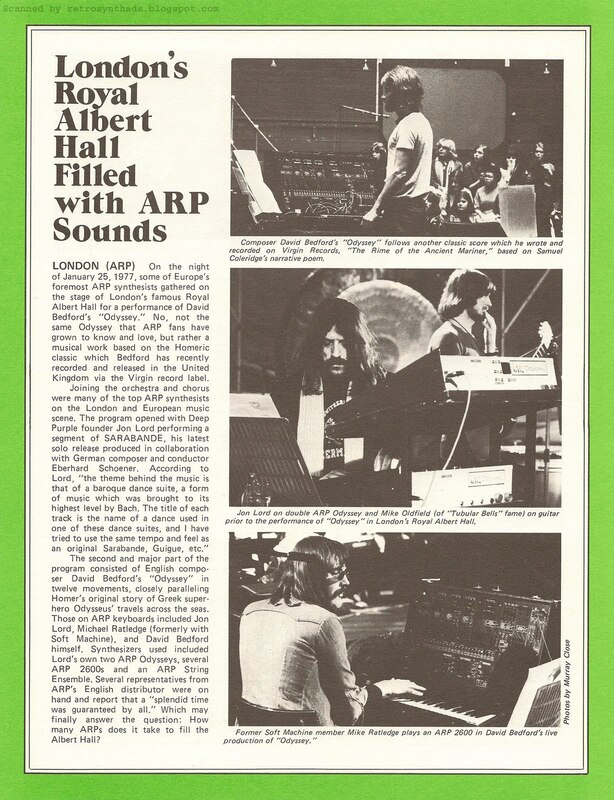 It makes me wonder why Yamaha didn't just take a page out of ARP's name-dropping book and start listing influential musicians. Yamaha E-70, E-50 and E-30 Electone organs ad #2 from page 9 in Contemporary Keyboard Magazine June 1980. 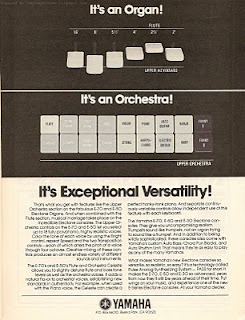 This rare advertisement only ran once or twice in Contemporary Keyboard in mid-1980. Which is common for Yamaha. 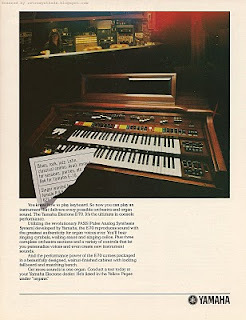 After the initial ad for the E-series ran semi-regularly from November 1977 to July 1978, Yamaha didn't run ads for these organs too often. The second ad didn't start running until a year after that first one stopped, and then only ran four or five times over the next year and a half, with the last one appearing in January 1981. Then, it was four months later that this ad finally showed up. Unlike the second ad, which had no reference-like ad-copy at all, this third ad finally provided readers with a few more details about what this beast was capable of. And it begins with a large font and very clear language. 1. It's an Organ! 2. It's an Orchestra! 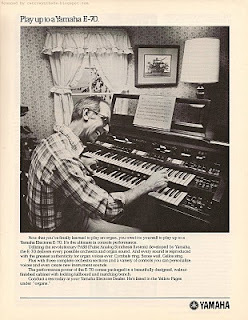 The black and white close-up images that accompany these two tag lines highlight these two features of the organ nicely, and the ad-copy goes on to explain some of the more musical features of the presets. 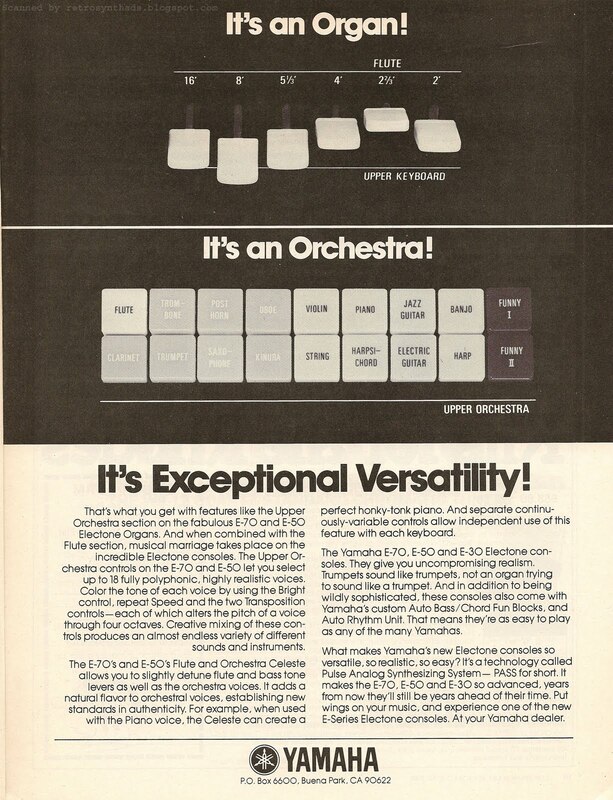 And one of the first things Yamaha tries to get across to readers is that when the orchestra presets are "combined with the Flute section, musical marriage takes place on the incredible Electone consoles". Interestingly, friend of the blog and fearless E-70 organ enthusiast "FlameTopFred" (I'm going to lose the quotes around his name from now on), made a similar statement in a recent email exchange concerning comparisons between the E-70 and CS-80. "When using the orchestral presets, a key feature is being able to bring in some of the flute sounds (Flute on Electone is really a Hammond clone type of drawbar sound). This gives you an additional bank of Hammond tones that can be quite useful. 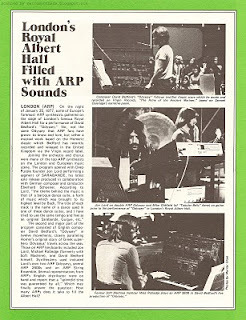 The CS-80 was great - but it was missing that bank of flute (Hammond) tones. " The one area that I feel Yamaha could have really made these ads punchier is by adding colour. The close-up photo of the E-70's orchestra buttons that you see in all their gray-shaded glory, are actually bright white, red, yellow and green in real life. Colour would have really made the ad pop. White: Flute. Red: Brass. Yellow: Stings. Green: Synthetic tones. And after seeing those "Funny 1" and "Funny 2" buttons, I was even more curious about the sounds of the E-70 and its comparison to the CS-80. The preset buttons certainly looked similar. I turned to FlameTopFred for expertise in this matter. He has owned both, picking up his E-70 in part because he also thought those buttons looked mighty similar too. He bought his E-70 for $150 in 2008, and the more he played with it, the more he kept coming across sounds that resembled his CS-80 synthesizer. "When people say the E-70 is not a CS-80 I remind them that most of the useful sounds on the CS-80 came from using the preset buttons and then using the panel controls for the resonance, the aftertouch and so on - - - you can do some of that on the E-70. No - they are not identical, but certainly very close and for $150 the E-70 is an inexpensive sound-alike for many musical applications. The E-70 is a remarkable instrument - and one that I think has been overlooked by synth aficionados. 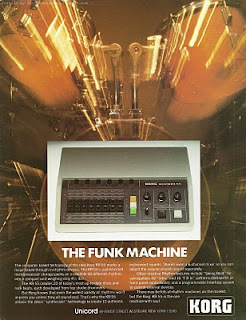 Funny I and Funny II are very close to the Funky I and Funky 2 sounds [of the CS-80]. Violin on the E-70 was close to the Strings 1 sound on the CS-80. Trombone and Trumpet were close to the Brass sounds on the CS-80." "For the wild filter sweep sound, it would be Funny I or Funny II, the two green buttons on the far right. From the red buttons, Trombone and Trumpet were very useful. Harpsichord and Banjo were good sound for bright, fast attack sounds. Clarinet was also quite good as a triangle or sine wave sound. Kinura at first listen was awful, but was one of the best for using the filter (Brilliance) control. Just as on the CS-80, between the octave buttons and the filter (Brilliance) control, there is a range of useful sounds from each orchestral button. And because you can combine those together (by coupling the Lower Manual sounds to the Upper Manual) there are sometimes very useful and musical blends using sounds that might not normally work on their own. The CS-80 was also like this - and people forget that. 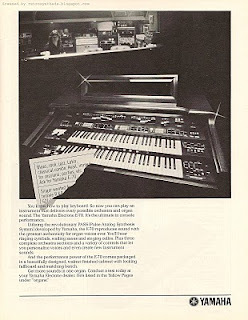 Most of the time on the CS-80 you're staring with one of the presets and working the other controls on the console. The Filter, the Resonance, and most especially with the aftertouch." "They have a fast filter sweep - sweeping both the filter and the resonance, very quickly. Funny I has a gentler sweep, gentler resonance, Funny II has a rapid attack sweep, with a short filter decay to a nice sustain, with a little more resonance in the attack. You can almost blow your speakers on Funny II." Thanks again to FlameTopFred for providing this useful information (and more for future blog posts!). He's done a fantastic job of bridging between the organ and synth communities. Definitely check out his YouTube site if you haven't already. And, he credits a lot of his knowledge to other YouTube videos, Yamaha's manual library site, and the Electone museum Web site. FlameTopFred recommends that if you are planning to buy an Electone, definitely check out these sites.